After a series of raids by the elite Densus, 88 counter-terrorism police, on Wednesday, arrested five terror suspects and thwarted their plot to attack a bank and local police stations in East Java. Handwritten details of the plot were found on the suspects after they were grabbed at three separate locations across Blitar Regency, said a local police chief on Thursday. In May, three churches and the city police HQ were hit by suicide -bombers and now several terror suspects have been arrested from Blitar – a three hours’ drive from Surabaya, the capital of East Java. “We found a few notes and on one of them was a plan to attack our police headquarters, a police post in Talun (sub-district) and a bank,” said Blitar police Chief Anissullah Ridha. All five suspects have since been brought to the Surabaya police headquarters for further investigations, he added. According to Antara state news company, one of the suspects, a doctor by profession is identified as NH, was armed with a gun with eight bullets. He and two others, identified only as SZ and AN, were arrested in a rented house. 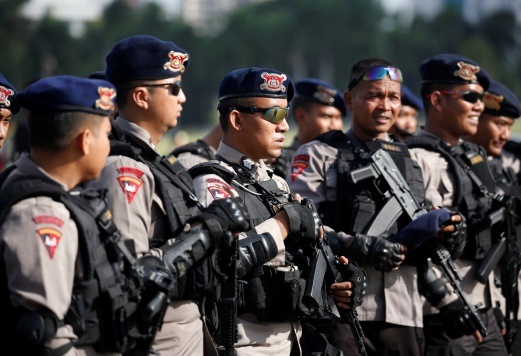 Lieutenant Colonel Anissullah said the latest arrests are part of efforts by the police to tighten security following the suicide-bombing at the church and police headquarters in Surabaya on May 13 and 14. The arrested 37 suspects in connection with those attacks which claimed 27 lives, including 13 perpetrators who are said to have been in sleeper cells with ties to the Jemaah Ansharut Daulah (JAD), a local terrorist group loyal to the Islamic State in Iraq and Syria (ISIS). Among the suspects in custody is Syamsul Arifin, a 37-year-old resident from Blitar who was picked up with his wife by police in Malang, East Java on May 16. Syamsul alias Abu Umar is said to be the leader of a JAD terrorist cell in East Java and police believe he had a hand in the Surabaya bombings, said Lieutenant Colonel Anissullah. Jakarta has been attacked by terrorists many times in the past. In the past decade only, there have been more than 20 terrorist attacks. Such problem doesn’t only concern this country but the whole world; terrorism has spread like poison especially with sleeper cells. They corrupt and blend into society as normal people would do and find new ways of perpetrating their destructive missions. The current investigative tools at law enforcement’s disposal, such as the DNA or polygraph test, are not sufficient enough and can’t keep up with the news ways terrorist perpetrate their plans. The arrest of these five terrorists is only one terror episode happening in Jakarta. As informed by Lieutenant Colonel Anissullah that some of these terrorist groups are linked to the Islamic State in Iraq and Syria (ISIS). Law enforcement must find a new and more improved way to reinforce their counterterrorism strategy. In addition, they must make a point and discourage terrorists from continuing with these attacks. Therefore, it is important to know what they plan in future and who are the masterminds and other members of this sleeping cell? How can specialized law enforcement and counterterrorism agents’ better fight against these anonymous terrorist cells? In today’s world, iCognative by Brainwave Science is the most reliable and efficient investigative tool. The magic of iCognative technology lies in its unique capacity to distinguish swiftly as well as accurately between terrorists and innocents, even before and after they strike, by conducting a simple iCognative test. Such a test will help to reveal concealed information or record of terrorist crimes committed and organizational attack plans as well as other details that are stored in a perpetrator’s brain’s memory bank. The applicability of iCognative extends to Law Enforcement, Border Security, Counterterrorism, Counterintelligence and many more. The main advantage of this technology is that it can easily determine what the suspects know, based on a simple effective test. The test can be conducted by an investigative agent, on any suspect or individual related to the case. To conduct a test on a subject, the test case needs to be built with information about the case, used as stimuli. This information is confidential, known only to the investigative agents and the perpetrators. Considering our case, the investigative agency can also use: information regarding previous Jakarta attacks in the area and to check for a connection. The information we have from the media: date of the previous attack being planned – May 13, 14; the place – three churches and a city police HQ; The location- Surabaya; the objects the first suspects, NH, had when arrested – gun with eight bullets. This information, used as stimuli in the form of words, phrases or pictures, depending on its availability, will be displayed to the suspect on a Screen, one after another. iCognative system collects brain responses to each stimulus and all these brain responses are analyzed at end of the test by unique software and determine with 99.9% accuracy if the information is present or absent in the brain of the suspect. iCognative relies on detecting a distinct change in electrical activity when a human brain responds to the sight of familiar stimuli. iCognative can provide important insight about this foiled plan to help authorities make huge advancement in eliminating these local terrorist organizations. Further application of the system can help differentiate between the ranks in terrorist organizations, uncover their funding operations, the modus operandi of a terrorist network and thereby help disseminate the root cause of all problems. This characteristic makes iCognative technology is virtually unprecedented and highly reliable. iCognative by Brainwave Science has a proven track record of supporting law enforcement agencies protect innocents and help Anti-Terrorism Police capture all terrorists within the country.